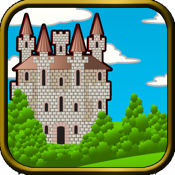 Wizard's Castle for iPhone 4 is an exciting match and remove game for all ages. The player enters the castle to find that the friendly Wizard has cast a spell and colored, magic balls are raining down from the ceiling. The goal of the game is to prevent the room from filling up with balls during each three minute round. Players match and remove balls by touching groups of two or more balls of the same color. While manageable at the lowest levels, the game quickly presents a difficult challenge to both hand-eye coordination and finding a winning strategy. Completing a level unlocks the next. Wizard's Castle for iPhone 4 features 8 levels of play and Game Center leaderboards and achievements. In addition to locating groups of still and moving balls of the same color and preventing the room from becoming completely filled, in some levels magic gems also drop from the ceiling. Wizard's Castle for iPhone 4 is highly re-playable because the colored magic balls always fall differently. Players may earn up to three stars for each level depending on their score, and may replay any level to reach the maximum of three stars. Current Score, High Score, Level, and Time Remaining are continuously displayed at the top of the landscape mode screen.